Has ability to scan multiple pages using a scanner with feeder, automate save to multipage PDF or TIFF when last page scanned. Has ability to detect paper jam event. Capture images from all the TWAIN compliant scanner and webcam devices and save to Microsoft Word ( docx ), PDF, BMP, GIF, JPEG, JPEG 2000, PCX, PNG, PSD, TIF, TGA, PGX, RAS, PNM image files. Support add texts to specific page when save to multi-page Microsoft Word ( docx ) file. Support load images file (BMP, JPG, GIF, PNG, Multi-page TIFF) from hard drive. Perform OCR processes an entire page or only specific areas. Support Blank Page detection, Get the Confidence value of specific page. 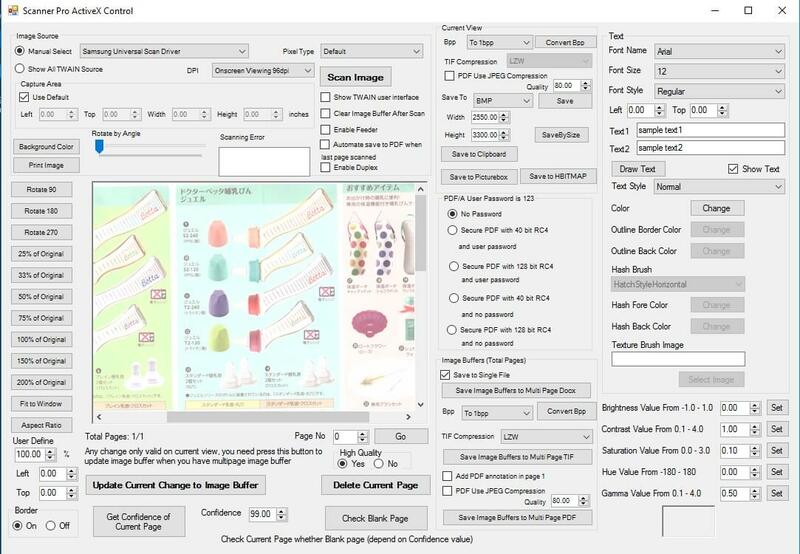 (Use Confidence value can handle different blank page condition) Support use JPEG compression, adjust quality when save to PDF/A file, (Save, SaveBySize, SaveAllPage2PDF, OCR2SearchableMultipagePDF methods ) . It can output small file size of PDF/A file. Support convert scanned images to 1bbp, 4bbp, 8bpp, 8bpp Grayscale, 24bpp, 32bpp, 32ARGB bpp. Support PDF Annotation before save to PDF/A file, add fonts, images, draw text, rotated text , line, rectangle to PDF file. Support save as multipage TIFF ( JPEG, Packbits, LZW, CCITT G.3 and G.4 compression) and multipage PDF or PDF/A file. With JPEG compression of TIFF file, it can reduce file size of TIFF file. Support save as 1bpp, 4bpp, 8bpp, 24bpp TIFF file. Support securing a PDF document using 40 bit, 128 bit RC4 encryption and owner, user password. Support adjust standard PDF permissions: Printing, High Quality Printing, Changing the document, Content copying or extraction, Filling of form fields, Content extraction for accessibility, Document assembly. Has ability to enable/disable progress bar when scanning. Has ability to adjust the scanner image resolution (DPI). Has ability to adjust the scanner capture area. Has ability to enable/disable ADF feeder. Has ability to enable/disable duplex scanning.